SHS is one of the leading manufacturers in the airsoft industry when it comes to performance upgrade or repair parts. SHS Airsoft offers you reliability and quality at an affordable price.This gear set is no exception. 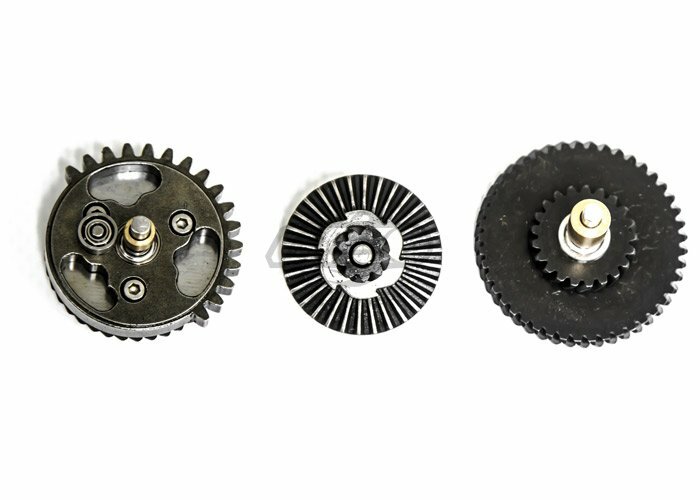 Constructed out of CNC machined steel, and heat treated, these gears offer durability like no other. Unlike other gear sets, this design features a bearing axis for reduced friction and a larger bearing sector delayer for better feeding In return producing less noise and less heat build up. The 100:300 ratio also provides crazy torque, which when paired with other upgraded parts can provide crazy rate of fire or the ability to pull heavy springs, all the way up to M170. The Super Shooter 100:300 gears are the perfect gearset for your next build. Is this Half tooth or Full tooth gear set? I ask because I often see descriptions that don't include this information and I don't want to assume what type of teeth it has. What spring can be used? What's the max spring tension these gears can handle? Airsoft GI does not recommend the use of any spring over an M120.